Accused of Abduction / Kidnapping in Washington State? If you, or someone you know, is facing a Washington state kidnapping offense the government must prove the elements of that crime beyond a reasonable doubt. These elements are laid out under the Washington State criminal statutes. Washington state kidnapping charges are broad and serious. 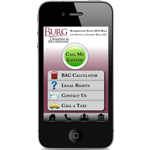 All kidnapping charges are felonies and include significant penalties. If you have any questions about the elements of the Washington State kidnapping charges, please feel free to contact us for a free consultation. (1) "Restrain" means to restrict a person's movements without consent and without legal authority in a manner which interferes substantially with his liberty. Restraint is "without consent" if it is accomplished by (a) physical force, intimidation, or deception, or (b) any means including acquiescence of the victim, if he is a child less than sixteen years old or an incompetent person and if the parent, guardian, or other person or institution having lawful control or custody of him has not acquiesced. (3) "Relative" means an ancestor, descendant, or sibling, including a relative of the same degree through marriage or adoption, or a spouse. (e) To interfere with the performance of any governmental function. (2) Kidnapping in the first degree is a class A felony. (1) A person is guilty of kidnapping in the second degree if he or she intentionally abducts another person under circumstances not amounting to kidnapping in the first degree. (2) In any prosecution for kidnapping in the second degree, it is a defense if established by the defendant by a preponderance of the evidence that (a) the abduction does not include the use of or intent to use or threat to use deadly force, and (b) the actor is a relative of the person abducted, and (c) the actor's sole intent is to assume custody of that person. Nothing contained in this paragraph shall constitute a defense to a prosecution for, or preclude a conviction of, any other crime. (3)(a) Except as provided in (b) of this subsection, kidnapping in the second degree is a class B felony. (b) Kidnapping in the second degree with a finding of sexual motivation under RCW 9.94A.835 or 13.40.135 is a class A felony. (1) A person is guilty of unlawful imprisonment if he knowingly restrains another person. (2) Unlawful imprisonment is a class C felony. (d) Retains, detains, or conceals the child or incompetent person in another state after expiration of any authorized visitation period with intent to intimidate or harass a parent, guardian, institution, agency, or other person having lawful right to physical custody or to prevent a parent, guardian, institution, agency, or other person with lawful right to physical custody from regaining custody. (c) Causes the child to be removed from the state of usual residence. (3) A parent or other person acting under the directions of the parent is guilty of custodial interference in the first degree if the parent or other person intentionally takes, entices, retains, or conceals a child, under the age of eighteen years and for whom no lawful custody order or parenting plan has been entered by a court of competent jurisdiction, from the other parent with intent to deprive the other parent from access to the child permanently or for a protracted period. (4) Custodial interference in the first degree is a class C felony. (1) A relative of a person is guilty of custodial interference in the second degree if, with the intent to deny access to such person by a parent, guardian, institution, agency, or other person having a lawful right to physical custody of such person, the relative takes, entices, retains, detains, or conceals the person from a parent, guardian, institution, agency, or other person having a lawful right to physical custody of such person. This subsection shall not apply to a parent's noncompliance with a court-ordered parenting plan. (c) if the court finds that the parent has engaged in a pattern of willful violations of the court-ordered residential provisions. (3) Nothing in subsection (2)(b) of this section prohibits conviction of custodial interference in the second degree under subsection (2)(a) or (c) of this section in absence of findings of contempt. (4)(a) The first conviction of custodial interference in the second degree is a gross misdemeanor. (b) The second or subsequent conviction of custodial interference in the second degree is a class C felony. (1) Any reasonable expenses incurred in locating or returning a child or incompetent person shall be assessed against a defendant convicted under RCW 9A.40.060 or 9A.40.070. (d) The offender, after providing or making a good faith effort to provide notice to the person entitled to access to the child, failed to provide access to the child due to reasons that a reasonable person would believe were directly related to the welfare of the child, and allowed access to the child in accordance with the court order within a reasonable period of time. The burden of proof that the denial of access was reasonable is upon the person denying access to the child. (3) Consent of a child less than sixteen years of age or of an incompetent person does not constitute a defense to an action under RCW 9A.40.060 or 9A.40.070. (b) Does not have the consent of the minor's parent or guardian or of the guardian of the person with a developmental disability; and (c) Is unknown to the child or developmentally disabled person. (2) It is a defense to luring, which the defendant must prove by a preponderance of the evidence, that the defendant's actions were reasonable under the circumstances and the defendant did not have any intent to harm the health, safety, or welfare of the minor or the person with the developmental disability. (b) "Person with a developmental disability" means a person with a developmental disability as defined in RCW 71A.10.020. (4) Luring is a class C felony. (C) Result in a death. (b) Trafficking in the first degree is a class A felony. (ii) Benefits financially or by receiving anything of value from participation in a venture that has engaged in acts set forth in (a)(i) of this subsection. (b) Trafficking in the second degree is a class A felony.